The Peregrine HD fixed frame screen series feature robust, 3.5" velvet coated frames, our acclaimed CineWhite matte white screen material for exceptional color balance and light uniformity and are covered by a limited-lifetime warranty. 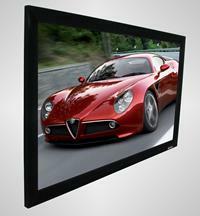 Peregrine HD screens are available in 16:9 diagonal sizes from 84" - 345”. Our CineGrey material is also offered as an option for use with low contrast DLP and LCD Home Cinema Projectors. A premier 16:9 aspect ratio fixed frame screen available in diagonal sizes from 84"-135” featuring a high (2.2) gain rear projection screen material.